What are the number systems in Computer? Number systems are the technique to represent numbers in the computer system architecture, every value that you are saving or getting into/from computer memory has a defined number system. Computer architecture supports following number systems. A Binary number system has only two digits that are 0 and 1. 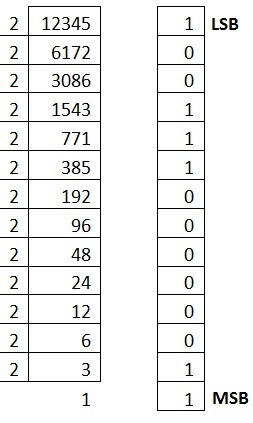 Every number (value) represents with 0 and 1 in this number system. The base of binary number system is 2, because it has only two digits. Octal number system has only eight (8) digits from 0 to 7. Every number (value) represents with 0,1,2,3,4,5,6 and 7 in this number system. The base of octal number system is 8, because it has only 8 digits. Decimal number system has only ten (10) digits from 0 to 9. Every number (value) represents with 0,1,2,3,4,5,6, 7,8 and 9 in this number system. The base of decimal number system is 10, because it has only 10 digits. A Hexadecimal number system has sixteen (16) alphanumeric values from 0 to 9 and A to F. Every number (value) represents with 0,1,2,3,4,5,6, 7,8,9,A,B,C,D,E and F in this number system. The base of hexadecimal number system is 16, because it has 16 alphanumeric values. Here A is 10, B is 11, C is 12, D is 13, E is 14 and F is 15. A) Divide the Number (Decimal Number) by the base of target base system (in which you want to convert the number: Binary (2), octal (8) and Hexadecimal (16)). B) Write the remainder from step 1 as a Least Signification Bit (LSB) to Step last as a Most Significant Bit (MSB). A) Determine the base value of source Number System (that you want to convert), and also determine the position of digits from LSB (first digit’s position – 0, second digit’s position – 1 and so on). 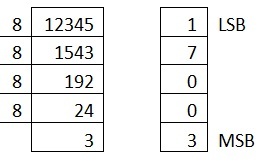 B) Multiply each digit with its corresponding multiplication of position value and Base of Source Number System’s Base. C) Add the resulted value in step-B. A)	Row 1 contains the DIGITs of number (that is going to be converted). B)	Row 2 contains the POSITION of each digit in the number system. C)	Row 3 contains the multiplication: DIGIT* BASE^POSITION. D)	Row 4 contains the calculated result of step C.
E)	And then add each value of step D, resulted value is the Decimal Number.